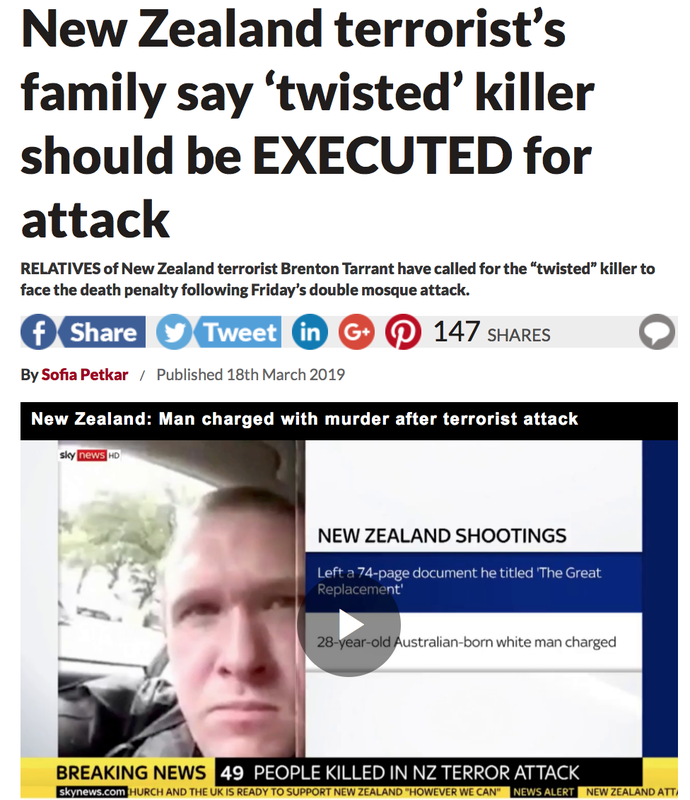 rocky's bru: After the Christchurch mosque massacre, we still want the Death Penalty banned? KL, 20 March: The Christchurch massacre teaches us a lot of things. One of them is that the campaign by some Malaysians to ban the death penalty is foolish and unjust. 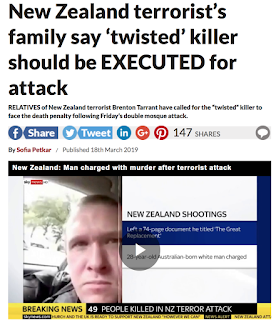 Brenton Tarrant, who mercilessly gunned down scores of unarmed Muslim civilians during Friday prayers last week, will live. Imagine that. Oh, sure, he has been charged and they say he "faces unprecedented sentence" but, be that as it may, he will live happily ever after. Why? Because there is no death sentence in New Zealand (and in Australia, the killer's country of birth). In New Zealand, being found guilty of murder usually comes with a minimum of 10 years in jail before possible parole. Imagine that! The longest-ever murder sentence imposed in New Zealand was in 2001 when a judge sentenced William Bell to life imprisonment with a 30-year minimum term for a triple murder. Which works out - yup - to 10 year's per life taken, give and take a couple of years. Tarrant knows this and obviously he does not want to die (otherwise, he'd have killed himself after the massacre, which is what they usually do). This man recorded the whole heinous act so apparently he fancies that one day he would be able to discuss what he'd done and why. Books will be written about him. Maybe even a movie. Heck, I won't rule out a video games. Along the way, they might try to make him out to be the "real" victim. Eventually, a hero. Others would want to emulate him. Elsewhere, including here in Malaysia, Tarrant would pay for his heinous crime with his own life. He would get justice. I believe that the laws we have today, here in Malaysia, especially the death penalty, is the reason why we still live, work and pray in peace. Many didn't give it much thought before but now, after the massacre in New Zealand, many believe the death penalty does not mean that life is cheap; on the contrary, it reminds us of how precious life is.